I hope you give these tacos a try. You truly won’t regret it! And don’t let the watermelon weird you out. Once you try it, you will love it! In a large skillet over medium high heat, sear the pork on all sides. In a small bowl or measuring cup, whisk together 1/4 cup water, hoisin, soy sauce, vinegar, honey, ginger, sesame oil, and chili paste. Add the pork to a slow cooker and pour over sauce mixture. If additional liquid is needed, add in up to 1/4 cup more water. Cook pork on low heat for 8 hours or high heat for 4 hours. Once cooked, use two forks to shred. In a separate bowl, combine watermelon, cucumber, green onion, and salt. Let sit in the fridge for at least 20 minutes. 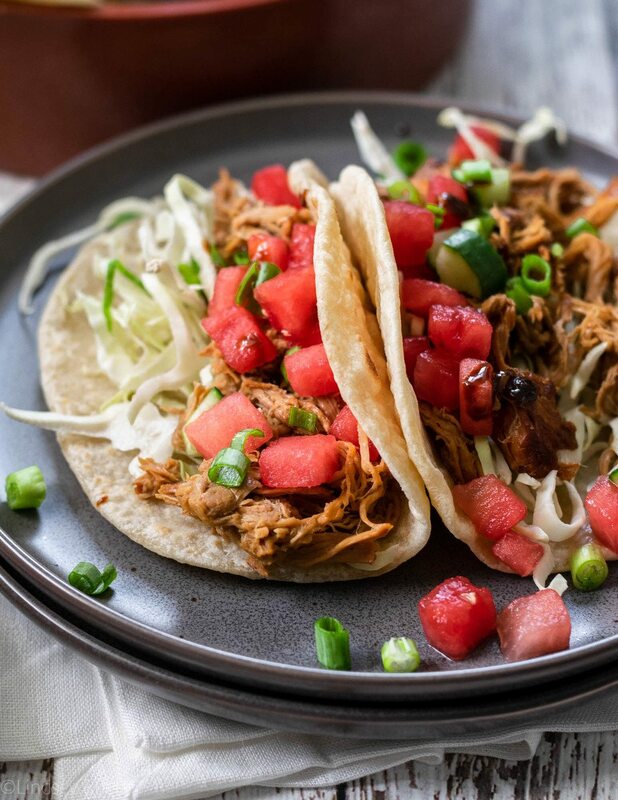 To assemble tacos, spread pork on top of the tortilla then top with salsa and cabbage. Drizzle on extra hoisin if desired.